The term “media” has an interesting and surprisingly short biography. As recently as the 1970s the Oxford English Dictionary listed only three meanings for this term––the oldest going back no further than the 1840s––and none of them had anything to do with newspapers, magazines, radio, film, or television, though the phrase “mass media” has circulated in popular American parlance since the 1920s. Instead, “media” is listed in the OED as a biological term denoting the middle membrane of an artery, while in phonetics it refers to a soft mute sound, such as in the consonants “b”, “g”, or “d”. The third definition is simply as the plural of the noun “medium”. On this view, iron bars or pools of water or even table tappers could be described as being “media” for sounds, waves, or disembodied spirits. Today “media” is such common (and sometimes abused) currency that we all know––or think we know––what we mean by it. Let’s explore different aspects of what by now we call “the media”, especially in their relationship to technology as vehicles or platforms for education. . . .
During the course of history, advances in technology have typically been accompanied by stern warnings about their false promises and dangers to our physical or mental health. Listen only to the words of Thamus, legendary king of Thebes, who according to Socrates had this to say to the divine Theuth when the Egyptian god presented the king with a new technology for recording events and memories called “writing”. Thamus’ words of caution did not prevent writing from becoming an increasingly widespread tool, first among priests and scholars and by now in the pudgy hands of every eager first grader. No elementary school teacher would wish it otherwise. And yet there is prescience in Thamus’ warning. Our powers of memory today, it would seem, are no match for those of the Ancient Greek bards, who we are told, could recite Homer’s epic poems by heart, hours at a time. And I hear high school teachers say they can tell by its tone and fluency whether a student’s essay was hand-written or composed on a keyboard. Do I wish to imply that we should roll back the teaching of writing or extend “Screen-Free Week” to all electronic communication? No. (How, after all, could I expect you to be reading this article, if I did?) Rather, my point is to suggest that Socrates’ cautionary tale hints at an aspect of technology we may be prone to overlook. As the root meanings of the word suggest, technology [Gr. techne, “tool” and “way, means”] implies something about instruments, on the one hand, and something about ways to use them, on the other. Now, before you can make use of a tool, you need first to develop a measure of skill to carry out on your own the physical or mental deed that the tool is intended to make easier. Don’t give toddlers a hammer, for example, until they have mastered some level of skill at hitting things accurately. Keep calculators away from children until they have acquired some proficiency in arithmetic operations. In the first case, youngsters need to build up physical muscle before a hammer can serve as a useful (rather than as a recklessly destructive) tool; in the second case, children need to build up “spiritual muscle”––say, through mental math––before a calculator can function as a useful aid to intellectual operations rather than as a substitute for them. Herein lies the key: give a child a tool early on in life, and it will supplant the very skill it was intended to supplement. In other words, tools become prosthetics, or crutches, if introduced too soon. Their use also tends to become addictive. Which human skill are these electronic “tools” designed to assist or even mimic? At which age will children have developed these skills sufficiently so that these “tools” can serve rather than subvert them? Let’s take television, perhaps one of the more controversial examples. Television mimics the human ability to create pictures. According to Rudolf Steiner, children learn to think by inwardly creating mental pictures and mental images. If pictures are outwardly supplied ready-made, they rob the child of the opportunity to build the “imaginative muscle” needed to become independent thinkers. Since the ability to think unfolds gradually, the age at which children can benefit from television, rather than become slaves to it, will vary. A general guideline, though, will be: the later, the better, recognizing that we cannot shut off our children from all exposure to these kinds of tool. Instead, Steiner goes on to say, the more we expose ourselves to technology (rather than flee from it), the more we need to strengthen in ourselves––for instance, through the arts–– precisely those human capacities that technology mimics or supplements. Which human skills does the computer mimic or supplement? At which age will children have developed these skills sufficiently so that the computer can assist rather than hijack them? The first question: Which human skills does the computer mimic or supplement? It is tempting to think of the computer as a fancy calculator or stern grammarian, and for many people (myself included) this device does indeed serve these functions. But what makes the computer distinctive from other technological devices is its ability to simulate human experience. In fact, as one respondent suggested, we should rename the computer “the simulator” in recognition of the tremendous benefits that the computer has wrought in our culture, especially in the fields of engineering, medicine, and––yes––entertainment and even broadcasting. Computer models allow us to test new engines, fly new airplanes, try out new drugs without even creating them in the physical world. Using virtual models, we are able to experiment with new designs and simulate their effects. By the same token, every weather map you see on the evening newscast and just about every vehicle or building you see get blown up in a scene of a so-called “action movie” these days is some kind of computer simulation. If you have remained seated in the cinema long enough for the end of the credits, you will know just how many people work on a film’s computerized “FX”. So, what’s the problem with that? The problem is the same as for all examples of technology. It’s great when it supplements a skill you have already developed, and it’s not so great when it supplants it. If you have mastered some drawings of projective geometry, the computer can enhance your understanding and appreciation of this mind-bending subject through models of geometric forms set whirling in simulated motion. But in teaching this subject, I would never wish my students to work with these simulations until they had first achieved a measure of skill in making their own drawings. It’s the difference between listening to a recording of music you don’t know and listening to a recording in which a skilled soloist plays precisely the piece you have struggled for months to play for yourself. The recording is all the more thrilling if it supplements your own experience rather than replacing it. There, then, is the first point: the computer supplies us with a virtual experience that can serve to supplement our actual, that is to say lived, experience. The mischief––including, I would suggest, the beginning of addiction––begins when the computer supplants it. Virtual experience is of a different order of being than lived experience. It is like an advertisement for a loaf of bread: the promise––but not the delivery––of nourishment. If anything, the image will stir the craving but not, of itself, relieve it. The second question: At which age will children have developed these skills sufficiently so that the computer can assist rather than hijack them? If we can recognize the specific genius of the computer as being its ability to simulate human experience, then (at least in an abstract way) we have already answered the second question. The child will be ready to benefit from simulated experience to the degree it has already engaged in its own lived experience. But here’s the rub: who is willing––or even able––to withhold the computer from children for that long? As one set of parents reported in response to our questions, the more they try to keep the computer from their children, the more they run after it. So we need an alternative approach. Empirically, we know that children need to exercise all three of these capabilities if they are to enjoy a healthy physical, emotional, and spiritual life, both in childhood and later in adult life. In the context of Waldorf education, we know that all three of these exercises involve the child’s developing sense of self, or “I”. When the child’s “I” is engaged, the child will develop healthily; when the “I” is not engaged, the child will not mature. Empirical studies show that the “I” is most engaged when the child is stirred to physical movement (especially in the pre-school years), when it is inspired to create mental pictures (especially during the grade school years), and when it is motivated to embrace self-directed lived experience (especially in high school and in the years that follow). To the degree then, that children spend their time on the computer at the expense of exercising these three capacities, to this same degree their caretakers––that is, we as their parents and teachers––need to provide all the more opportunities to develop them. A ratio of computer time to movement time; a ratio of computer time to mental creativity time; a ratio of virtual computer experience to lived experience needs to be calculated –– perhaps negotiated and modified, as the child gets older. The key point, though, is that movement, mental creativity, and lived experience are “front loaded”, so to speak. First the real, then the simulated, or e-real. Otherwise, the child will run the risk of growing up without the full involvement of its “I” or ego. And when ego is treated as e-go, in time it will be e-gone. About the author: Douglas Gerwin is the Director of the Center for Anthroposophy and Co-Director of the Research Institute for Waldorf Education, and has taught history, literature, German, music, and life science at the Waldorf high school level since 1983. He presently divides his time between adult education and teaching in various North American Waldorf schools. Douglas is the founder of the Waldorf High School Teacher Education Program at the Center for Anthroposophy and editor of several books related to Waldorf education. Notes about the images and the title “The Sorcerer’s Apprentice” -Ed. The images are from “Fantasia” by Walt Disney and from Goethe’s “Der Zauberlehrling.” The Sorcerer’s Apprentice (German: Der Zauberlehrling) is a poem by Goethe, written in 1797. The poem is a ballad in fourteen stanzas. 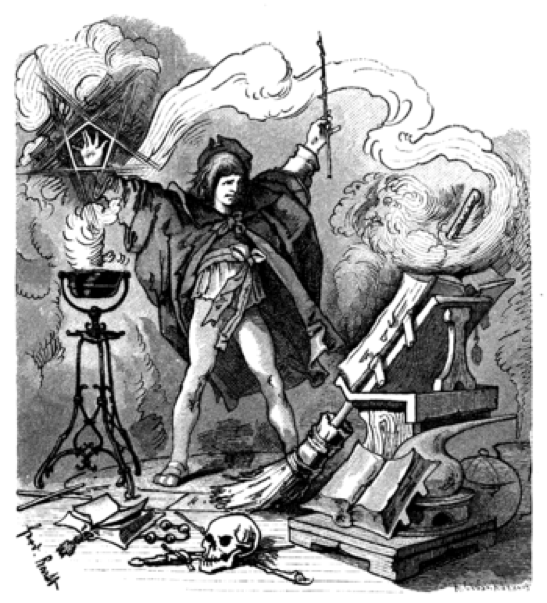 The poem begins as an old sorcerer departs his workshop, leaving his apprentice with chores to perform. Tired of fetching water by pail, the apprentice enchants a broom to do the work for him — using magic in which he is not yet fully trained. The floor is soon awash with water, and the apprentice realizes that he cannot stop the broom because he does not know how. Not knowing how to control the enchanted broom, the apprentice splits it in two with an axe, but each of the pieces becomes a new broom and takes up a pail and continues fetching water, now at twice the speed. When all seems lost, the old sorcerer returns, quickly breaks the spell and saves the day. The poem finishes with the old sorcerer’s statement that powerful spirits should only be called by the master himself. Der Zauberlehrling is well known in the German-speaking world. The lines in which the apprentice implores the returning sorcerer to help him with the mess he has created have turned into a cliché, especially the line Die Geister, die ich rief (“The spirits that I called”), a garbled version of one of Goethe’s lines, which is often used to describe a situation where somebody summons help or uses allies that he cannot control, especially in politics. 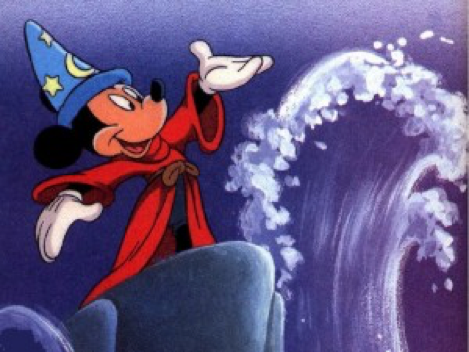 Fantasia, the animated dialogue-free 1940 Disney film Fantasia popularized the story from Goethe’s poem, and the Paul Dukas symphonic poem based on it, in one of eight animated shorts in Fantasia based on classical music. 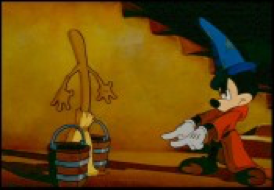 In the piece, which retains the title “The Sorcerer’s Apprentice,” Mickey Mouse plays the apprentice, and the story follows Goethe’s original closely, except that the sorcerer (“Yen Sid”, or Disney backwards) is stern and angry with his apprentice when he saves him. Fantasia popularized Goethe’s story to a worldwide audience. The segment proved so popular that it was repeated, in its original form, in the sequel Fantasia 2000.